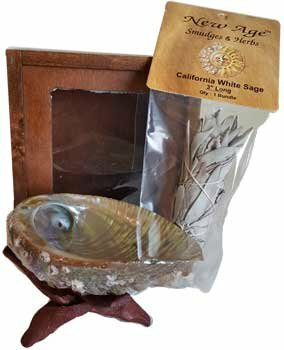 A sage smudge kit with abalone shell housewarming gift is a blessed gift for new home owners. 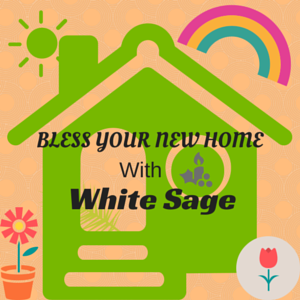 Using a sage home cleansing kit to bless the new house removes negative energy and welcomes positive energy into the new home. You feel inner peace after the house cleansing ritual. The sage smudge kit can also be used to purify your sacred space that you used for meditation. It can also be used to cleanse objects. Smudging with white sage has been traditionally used for energy cleansing and helps in relieving stress. The whole white sage cleansing kit consists of a white sage smudge stick, a real abalone smudging bowl plus a carved wooden tripod for holding the abalone shell. All of these are packed inside a handy smudge kit wooden box with a cover that slides neatly into it’s own grooves, with a window to see your smudging materials. The first step is to cleanse the house using the hand-made white sage smudge stick that is made from a generous 3″ bundle of California White Sage bound with a sustainable natural fiber. You walk all around the house with the smouldering sage bundle in the abalone shell, blessing every room as you enter. It is a good idea to get the white sage smudge kit with abalone shell housewarming gift for the new home owner to bless and energize the new home.